Armenian Foreign Minister Edward Nalbandian. 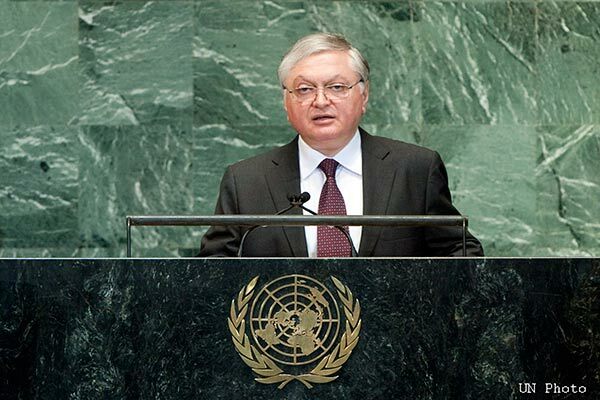 The Foreign Minister of Armenia, Edward Nalbandian led a chorus of criticism against views expressed by diplomats from EU member states ahead of the presidential elections. The diplomats, namely British Ambassador Katharine Leach and Polish Ambassador Zdzisław Raczyski’s had made mild criticisms and expressed hope for free and fair elections. Pro government politicians lined up to criticise the two Ambassadors and accusing them of interfering in internal affairs. The Foreign Minister then weighed in suggesting that the two Ambassadors had crossed the boundaries of diplomatic practise, with Nalbandian citing his experience as long time Armenian Ambassador to France to show how diplomacy should be done. Diplomatic circles in Yerevan are surprised by the audacity of this criticism given that Armenian diplomats in France, the United States and other countries are often involved in supporting candidates who are sympathetic to pro Armenian issues in the countries they are accredited to, whilst the Polish and British diplomats in Tbilisi were simply making comments about how the democratic process could be consolidated. “I’m pleased to say that the UK will send 25 election observers to join the ODIHR mission. We really welcome President Sargsyan’s commitment to holding Armenia’s best ever election. But it is disappointing that three of the key non-government parties in parliament are neither putting up a candidate of their own nor backing any other. Are these parties not standing because they lack finance, because they lack trust in a fair result, or because they are not really opposition parties as we would normally understand the concept? If they lack finance, is it because potential wealthy backers are concerned about what will happen to their businesses if they back the wrong horse or because they have not found a way of communicating their message in a way which would inspire donations from the general public? (It’s interesting that, despite predictions to the contrary, President Obama raised more funds than Mitt Romney in 2012, largely thanks to his success in connecting with voters and activists and getting many small donations of under $200). In monitoring the campaign and talking to members of all the parties over the next month, we’ll be doing our best to understand what more could be done to promote a truly vibrant spirit of political competition. But after over a decade of elections badly marred by fraud, perhaps the biggest challenge for the Armenian authorities in this election is trying to rebuild and win the trust of its people and partners. Will this happen? I very much hope so. Looking from the outside, it seems to me that the following three areas are crucial ones for state authorities to focus on during the election period and in the follow-up period afterwards. the voter list. I know there have been commendable efforts by local police and NGOs to check lists and deal with some of the inaccuracies and practices which look open to abuse (e.g. multiple names registered to a garage). But the fact that the list has continued to increase since 1991 when people’s day to day experience tells them that the country has lost population creates unease for the ordinary voter. Thinking about ways to give people confidence in the list perhaps by requiring an annual re-registering might be the answer in future. In the meantime, the authorities can make every effort to follow up and investigate precincts where there appear to be unusually high turn-out or vote tabulations showing surprisingly repetitive numbers. the involvement of public servants. It would be great to see strong messages from all senior political figures during the campaign about the importance of impartiality for all public servants (civil servants, teachers, doctors, lawyers, police etc), especially when they are dealing with their colleagues/subordinates, or those members of the public dependent on them (e.g. parents in a school). responding vigorously to complaints. Not all complaints may have sufficient evidence/legal base to result in a criminal charge, but if the authorities can show that they are responding quickly and seriously to concerns raised by citizens, this may have an increasingly preventative/deterrent effect, and will increase the ordinary voter’s confidence that the authorities mean what they say. We’re really looking forward to the campaign and hope that there will be a real discussion not just of personalities, but also of policies”.